Designer Pattern Swap: Easy Peasy Crew and Board Shorties – Everything Your Mama Made & More! 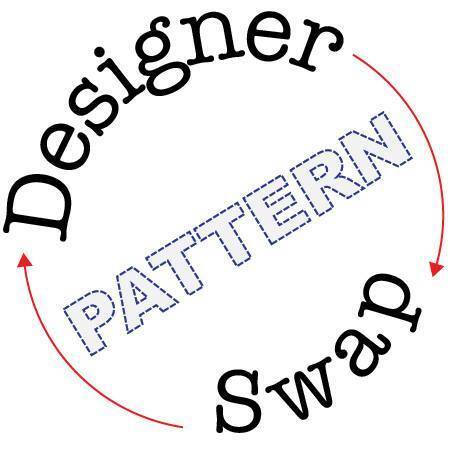 Like I mentioned on Monday, when I started assisting Kymy late last summer, I discovered that most PDF pattern designers are friends and support each other. Previously, as a customer, I’d just assumed that there was competition (you know, supply and demand and all that). Now I realize that these ladies are not only friends, but sometimes even mentor and offer help with small hiccups during the size grading and testing processes. I got matched up to sew the designs of A Sparkly Baby and was excited since I hadn’t yet tried any of Taryn’s patterns. When she mentioned that she had a new set of patterns just finishing testing that would be perfect for my little boys, I got even more excited! 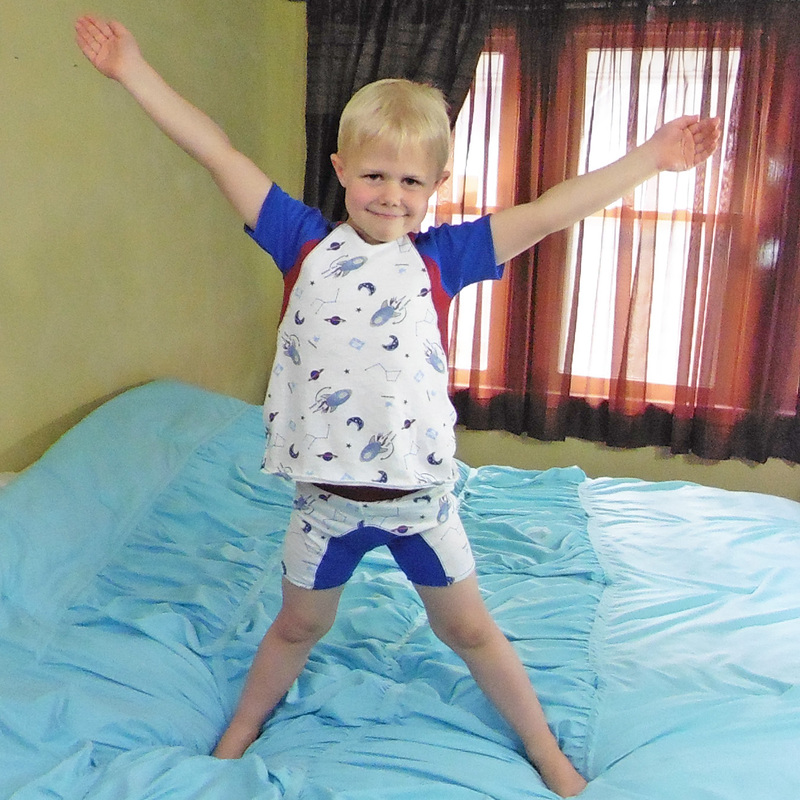 My oldest son has been wanting to be “on the blog” for several months now. Well … wish granted! I was able to squeeze all 3 outfits out of 1.5 yards of the spaceship print and some leftover scraps of blue ribbing and red cotton jersey. 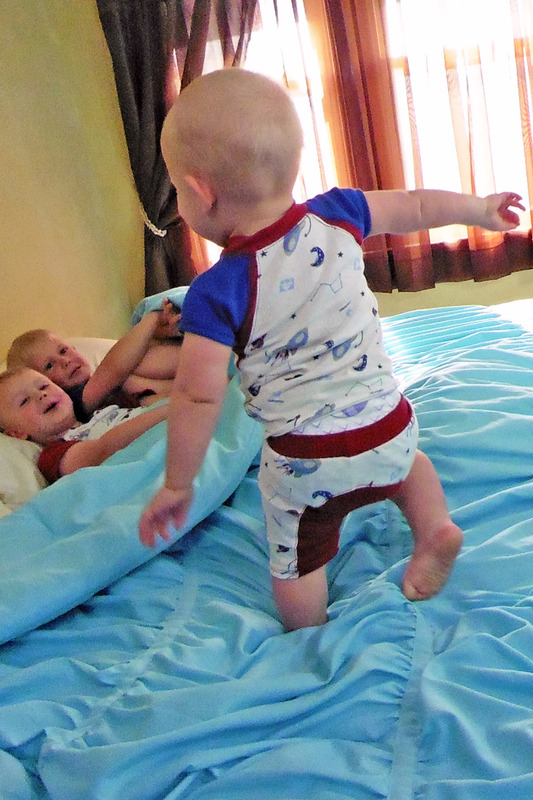 Despite the 2 year age difference between the boys, my older two are both wearing size 5t shorts and size 6 shirts and the baby is wearing 12m for both. I went with the sizes they usually wear in store-bought clothing since I was having a hard time getting them to stand still for the tape measure. 😉 Both of my girls have already put in requests for jammies from these patterns and also for regular shirts, which I’ll be able to fulfill because both patterns go up to size 14. I think it’s the details of the design that make these two patterns special. I love a good raglan shirt pattern. I’m head over heels for the contrast of the arm panels inset between the sleeves and body of the shirt. It stands out from standard raglans, but is still very easy to sew up. The detail of the collar coming to a vee in the center front is neat, too. It’s different enough to catch your eye, but still just as easy to install as a regular neckband! 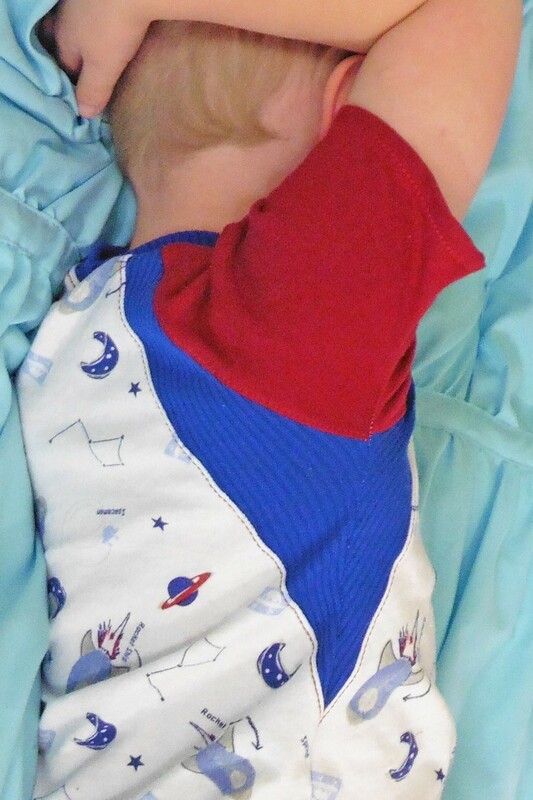 The curved seam on the front and back of the shorts is perfect for color blocking and so adorable when worn. I also appreciated the lack of elastic in the waistband because so often it gets twisted or my kids complain that it feels stiff. The Easy Peasy Crew and Board Shorties went together fast. I taped the patterns (which didn’t take much because there aren’t many pages) and cut fabric out the evening before, while little boys were sleeping. Even with some interuptions from the younger two the next afternoon, I managed to sew all six pieces in about 3 hours! To celebrate the Designer Pattern Swap, Taryn has put all patterns from A Sparkly Baby on sale for 20% off until April 26 with the code SWAP20. 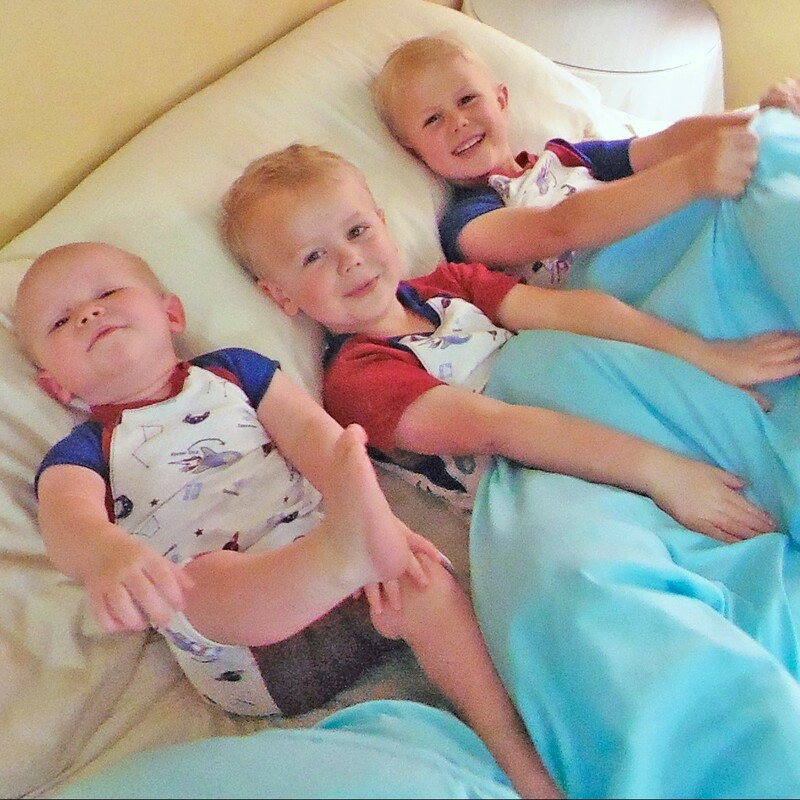 Now … whoever had the bright idea to give new pajamas to three boys and then throw them on the bed for pictures was crazy! They were all kinds of giggly and I had a hard time getting them to stay still. I finally gave up and boosted the ISO on my camera to reduce blurs and snapped away while they had fun. 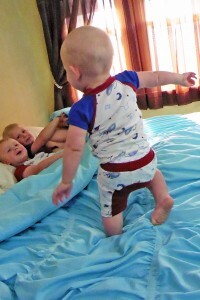 All three of them went to bed tonight, happily wearing their new matching jammies!